In its fifth biennial design competition, the Land Art Generator Initiative has awarded second place to Olson Kundig’s entry “Night & Day,” led by Design Principal Kevin M. Kudo-King, AIA, LEED® AP. Sponsored by the State of Victoria in Melbourne, Australia, this competition is for a large-scale public artwork capable of producing clean energy in the neighborhood of St Kilda. “Night & Day” combines solar energy with a hydro battery to produce 1,000 MWh annually for St Kilda – enough to power up to 200 Australian homes, 24 hours a day. 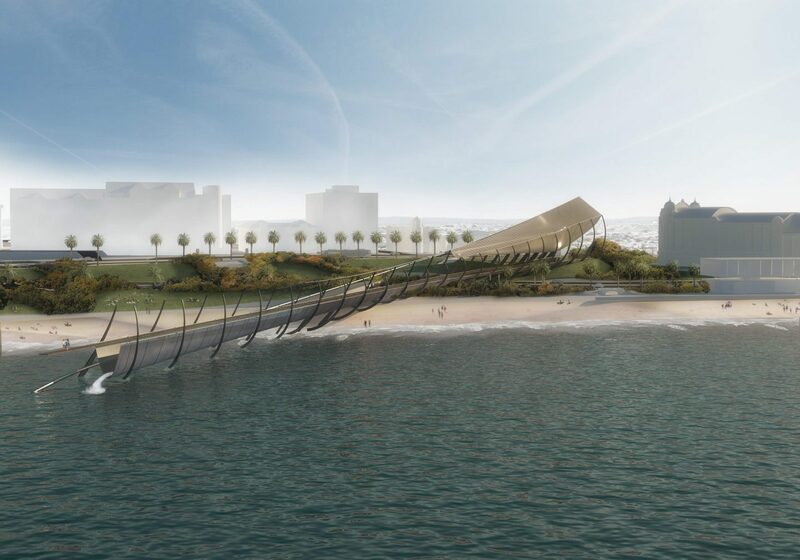 The artwork doubles as a power plant and pedestrian bridge that links city to bay. During daylight hours, energy harvested by a photovoltaic solar sail is used to power homes, and to pump bay water into a hydro battery vessel suspended above St Kilda Triangle. After sunset, water is released through two Pelton turbines that transform the kinetic movement of water into electricity. The design helps meet St Kilda’s peak and off-peak power requirements, all while providing visitors with a dynamic, safe and intimate experience of the energy-production process. For more information on the Land Art Generator Initiative and “Night & Day,” please visit http://landartgenerator.org/competition2018.html.